"To me...music exists to elevate us as far as possible above everyday life." Fauré composed the Pavane in F-sharp minor, Op. 50, in 1887 in Le Vésinet. He dedicated the work to the Countess Elisabeth Greffulhe, who was a patron of Parisian society at the time. Although it was originally written for orchestra alone, Fauré soon added a choral part, with an accompanying text by Robert Montesquiou, the Countess’ cousin. Both versions of the Pavane, with and without chorus, were premiered within a few days of each other in November 1888, though today it is rarely performed with the chorus. The pavane is a slow, processional dance form that was popularized in the 16th century. It is said to have originated in Italy, the name possibly being derived from “Padovana,” a dance from Padua. 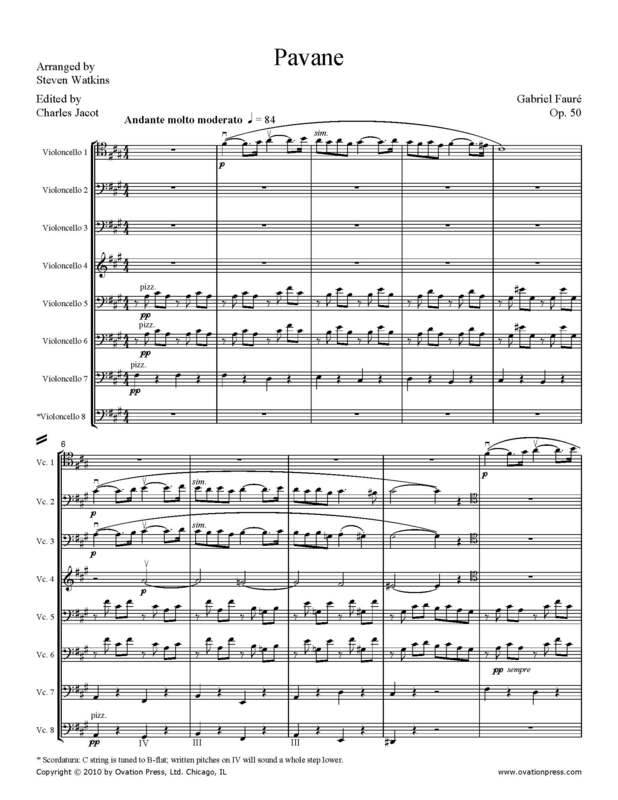 This particular arrangement also in F-sharp minor is for a cello choir, with all the parts adhering as close to the original composition as possible.